My wife and I departed for Rome on March 28, 2005 in order to celebrate our 25th wedding anniversary. Little did I know that this visit would coincide with the Holy Father's passing into eternal life and that we would once again be at his side, as we had been five years before in the Holy Land for our 20th wedding anniversary. As I approached the body in state of His Holiness John Paul II, I was awed by the greatness enveloped in this man and struck by the uncertainty of what the future holds for those so touched by the Pope's encouragement, including the Christians in the Holy Land. We accompanied the Pope on his pilgrimage in 2000, broke bread with him, and, like all our Christian brethren listening to the Pope in Manger Square, held on to every word that he spoke to the Palestinian Christians. John Paul II gave us all much-needed encouragement that has sustained us these last several years. It was only six months after his visit that the Al-Aqsa Intifada – the Palestinian resistance to Occupation – began, and many innocent men, women and children were killed in their beloved town of Bethlehem, as they were all around the West Bank and in Israel. John Paul II left behind a legacy of reconciliation and Christian example whose ripple effects will continue to be seen for many, many years to come. He laid down his life for Christ, and he consistently witnessed this by standing with the oppressed and humiliated and by giving sincere encouragement – to trust in God above all, but also to resist oppression peacefully. For the Christians in the Holy Land, his call to witness Christ and to preserve the Mother Church was a call both to endure suffering and to peacefully oppose the political force that caused Holy Land Christians to feel trapped, hopeless and disinclined to remain in the land sanctified by prophets and by Jesus Christ. Today, as Christians are squeezed out of Bethlehem and the last remaining Christian towns in Palestine, our Lord cries out to the world, "Why do you persecute me?" 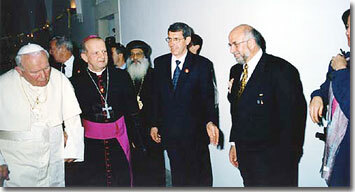 During my 2005 visit to Rome, I was encouraged by meetings with leaders of the Catholic Church who pledged support for the Christians in the Holy Land, through the programs of the Holy Land Christian Ecumenical Foundation. On March 31, I met with Cardinal Jean-Louis Tauran, Vatican librarian and archivist of the Roman Catholic Church and former Secretary for Relations with States (Foreign Minister). Cardinal Tauran reiterated his long-time support for the diminishing population of Christians in the Holy Land and said he will sacrifice anything for the Christians of the Holy Land. I was joined by my wife, Lady Rocio Rabie, LHS, and Fr. Emil Salayta, representative to the Latin Patriarch of Jerusalem, His Beatitude Michel Sabbah. We discussed the plight of the Christians, and Cardinal Tauran expressed the Vatican's willingness to help in any way possible in supporting the Christian population. During the same trip, due to the Pope's death, Governor Secretary His Excellency Sir Parola was not able to meet with me, and he appointed Msgr. Juan Dorronsoro, Ceremonial Director of the Equestrian Order of the Holy Sepulchre, to meet with me. We discussed the common interest of both organizations in supporting the presence of Christians in the Holy Land. Msgr. Dorronsoro and I shared our hope for future cooperation between HCEF and the Equestrian Order, and we began to make plans for this. I conducted several interviews with Vatican Radio in both English and Arabic, where I spoke about the plight of Christians in the Holy Land and the current situation in the Holy Land along with HCEF's upcoming plans. I was interviewed by Ms. Tracey McClure and Ms. Jamal Ward on Vatican Radio and by the Holy See press office. Lady Rocio carried out an interview with a Mexican television station. Today, at HCEF we are ever more committed and eager to continue the work begun by John Paul II – to continue watering the seeds of hope and freedom sown by his words. Today, we are convinced that through the bridges of solidarity built between Western and Arab Christians, the Church remains one Body in Christ, and no political force will prevail over our prayers and our peaceful support of the Christians in the Holy Land.